Otto Warmbier's Parents Dispute Trump's Seeming Absolution Of Kim Jong Un "Kim and his evil regime are responsible for the death of our son Otto," the Warmbiers wrote. Trump tweeted on Friday that he holds North Korea responsible, but he made no mention of Kim. Cindy and Fred Warmbier, parents of Otto Warmbier, released a statement saying, "No excuses or lavish praise can change" the fact that they hold North Korean leader Kim Jong Un responsible for their son's death. The Warmbiers are seen here at the U.N., where they spoke about human rights last May. After President Trump seemingly absolved North Korean leader Kim Jong Un in the death of American college student Otto Warmbier, the Ohio man's parents say they disagree and that "Kim and his evil regime are responsible." The issue arose in Vietnam on Thursday when Trump was asked at a news conference if he had talked to Kim — whom he has called a "friend" — about Warmbier, who died in 2017 shortly after his release from more than a year of detention in North Korea. Trump said he had asked Kim about it. "I really don't think it was in his interest at all," Trump said of the North Korean dictator. He later added, "He tells me that he didn't know about it, and I will take him at his word." After Trump spoke about his meeting with Kim in Hanoi, Fred and Cindy Warmbier issued a statement saying: "We have been respectful during this summit process. Now we must speak out. Kim and his evil regime are responsible for the death of our son Otto. Kim and his evil regime are responsible for unimaginable cruelty and inhumanity. No excuses or lavish praise can change that. Thank you." Trump responded on Friday afternoon in a pair of tweets in which he wrote, "I never like being misinterpreted, but especially when it comes to Otto Warmbier and his great family." "Of course I hold North Korea responsible ... for Otto's mistreatment and death," Trump wrote, but he did not mention Kim as bearing responsibility. When Warmbier was detained, he was accused of trying to steal a propaganda poster. By the time he was released in June 2017, he was in a coma, gravely ill. He died soon after his return to the United States. 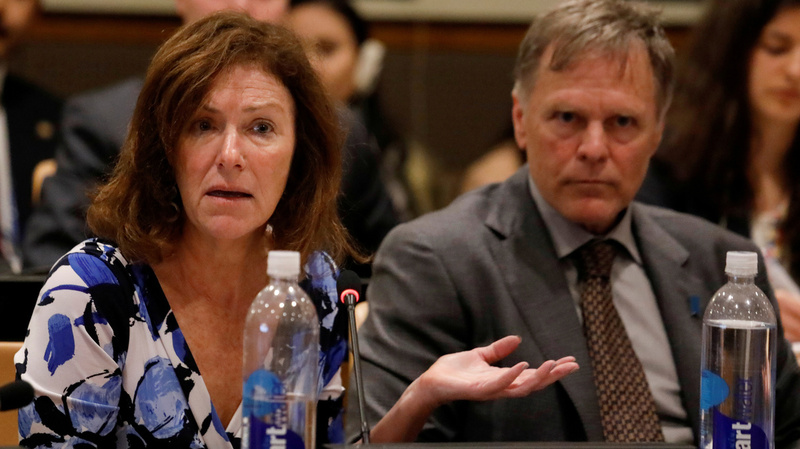 Fred and Cindy Warmbier issued their statement two months after a U.S. federal judge awarded them $500 million in their wrongful death lawsuit against North Korea — a lawsuit in which they said Kim's regime had "brutally tortured and murdered" their 22-year-old son. North Korea, which has previously tried to explain Otto Warmbier's death as being caused by botulism, did not participate in the case. 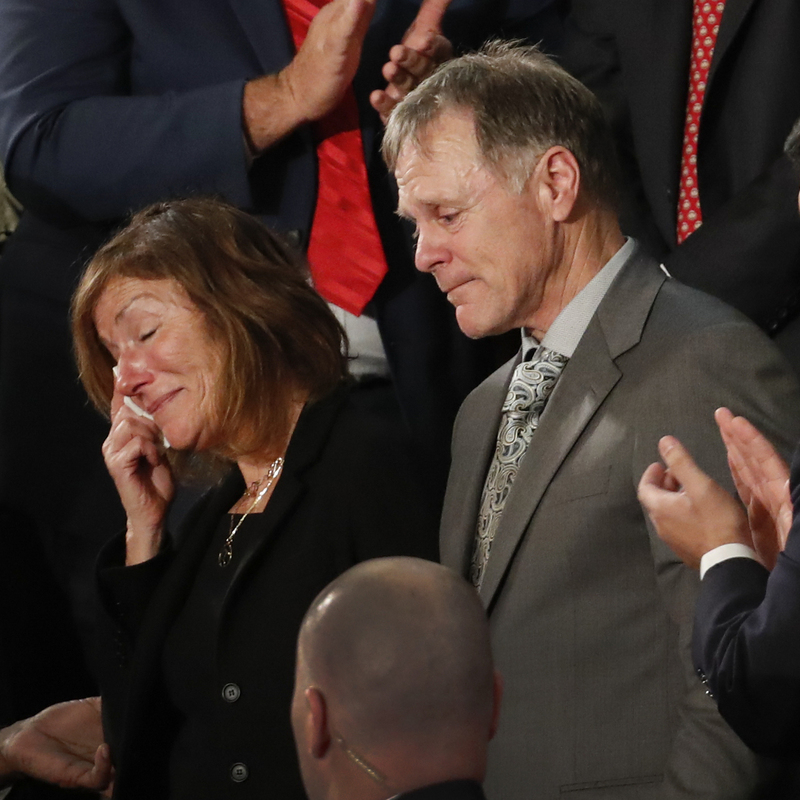 The parents of Otto Warmbier react to a standing ovation during President Trump's Jan. 30, 2018, State of the Union address on Capitol Hill in Washington. The Warmbiers attended Trump's State of the Union address at his invitation in January 2018, receiving a standing ovation when he introduced them during the speech. When their son died, months earlier, Trump had offered his condolences and said his administration will work "to prevent such tragedies from befalling innocent people at the hands of regimes that do not respect the rule of law or basic human decency." Even as he made what many see as a 180-degree shift by no longer holding Kim responsible, Trump acknowledged having a personal relationship with the Warmbiers when he was asked about Otto on Thursday. "I know the Warmbier family very well," he said. "I think they're an incredible family. What happened is horrible. I really believe something very bad happened to him, and I don't think that the top leadership knew about it." Trump's comments drew a critical response from members of Ohio's congressional delegation, including Republican Sen. Rob Portman, who took to the Senate floor hours after the president's remarks to say the U.S. cannot be "naive" about Kim and about what happened to Warmbier. Portman said that his experience in trying to aid the Warmbiers' attempts to help their son had convinced him that it's important for the U.S. to have more open lines of communication with North Korea. But he added that the way Kim's government had treated the young American was "unforgivable." "We can't be naive about what they did to Otto, about the brutal nature of the regime that would do this to an American citizen," Portman said. "And of course, it's not just about Otto or other visitors — it's about how the people of North Korea are treated, many of whom have also had their human rights violated." Sen. Sherrod Brown, a Democrat from Ohio, told ABC News that Trump has a duty to fight human rights abuses in the international arena — and that Warmbier's case is a prime example. "You never should go meet with the North Korean dictator without bringing up the name of Otto Warmbier and bring up the whole issue of human rights over and over," Brown said. "That's who we are as a country."